I was taken by Whisperers at 2pm, so I never pulled the lever for the laundry chute. That's what bothered me most. This is way ahead in the story, though. A lot happened before that. The town of Spindrift is frequented by pirates, Shadow Mages and charlatans. It's also home to th... read full description below. I was taken by Whisperers at 2pm, so I never pulled the lever for the laundry chute. That's what bothered me most. This is way ahead in the story, though. A lot happened before that. The town of Spindrift is frequented by pirates, Shadow Mages and charlatans. It's also home to the Orphanage School, where Finlay lives with Glim, Taya and Eli. Just outside town is the painfully posh Brathelthwaite Boarding School, home to Honey Bee, Hamish and Victor, Duke of Ainsley. When the two schools compete at the Spindrift Tournament, stakes are high, tensions are higher, and some people are out to win at any cost. Before long, the orphans and the boarding school are in an all-out war. And then Whispering Wars break out, and Spindrift is thrust onto the front lines. Children are being stolen, Witches, Sirens and a deadly magical flu invade the town, and all attempts to fight back are met with defeat. Finlay, Honey Bee and their friends must join forces to outwit the encroaching forces of darkness, rescue the stolen children, and turn the tide of the war. But how can one bickering troupe outwit the insidious power of the Whisperers? And who are the two mysterious figures watching them from the shadows? 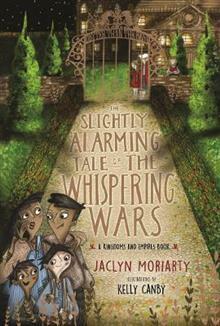 From the award-winning Jaclyn Moriarty comes a spellbinding tale of unlikely friendship, unexpected magic and competitive athletics.